The white Contact Us form below is for general questions only and not for making reservations. To book your reservation, please Book Online . Thank you for choosing South Shore Canopy Tours. We encourage you to Book Your Reservation Online before you come! For your security and convenience we only use Pay Pal. Pay Pal accepts all Major Credit Cards. Please incude Date, Ship and Port! You will receive a Voucher from South Shore Canopy Tours that will include your Reservation, Pay Pal Payment, and Directions to your South Shore Tour guide that will be waiting for you. Pay Pal will send you a separate confirmation of payment. Please PRINT and COMPLETE the South Shore Zip Line Tour Liability Waiver before you come and have a copy ready to give to our Tour opporator. Only one waiver form is needed per family but each member must sign the form. Payment Due In Full at Time of Reservation. Refunds minus 15% handling fee, are given only if the South Shore Tour Operator cancels due to inclement weather (torrential rain or hurricane), or if the Cruise Ship does not come to port. The refund will come in the form of a business check from South Shore Canopy Tours - Warren Holding Co. Refunds, minus the 15% handling fee, are only available prior to two weeks before your tour reservation date, should you cancel your cruise. Thank You for Choosing South Shore Canopy Tours for your Roatan Adventures. 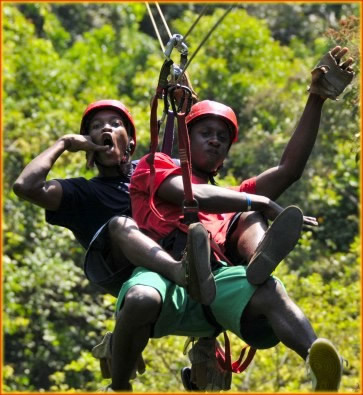 you up for your Zip Line Adventure. bug repellant. Cameras are recommended. West Bay Road, Roatan, Bay Islands, Honduras, C. A.